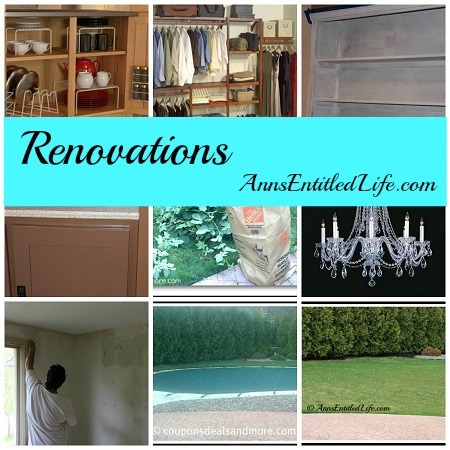 I have made mention that Hubby and I are doing house renovations this year, and I have blogged about a few of them. And this is what we added since those additions! We expected to have something done to the Dryvit. Hubby picked out the current color. When we moved here, it was a nice almond color but they didn’t do a great job of applying it – the application looked thin and almost see through. Our Dryvit is purely decorative, and there is brick underneath. Well, since it appeared like they didn’t use enough Dryvit we had another coat applied, and Hubby picked the color. It was a baaaaaad choice. The undertone was red, and when the sun hit the house the red undertone came out. We took to calling our house the “Pink Palace”. This time, I chose the color. We also knew we wanted the trim painted, so I am surprised it wasn’t on our original renovations list. It was last painted 7 years ago, and the back windows get full sun, and a few of them have flaking paint. • Do something with the built-ins in the family room DONE! • Install hardwood flooring in the living room, family room and Hubby’s office DONE! • Paint Sonny-boy’s old room DONE! • Replace the window in Sonny-boy’s old bathroom DONE! • New dining room chandelier DONE! • Replace laundry room sink and faucet DONE! • Repair/paint the Dryvit DONE! • Paint the house trim DONE! • Paint the railings and gate DONE! • Paint Sonny-boy’s old bathroom DONE! • Paint the kitchen trim DONE! • Replace fogged window DONE! • Replace broken window, repair cranks and window seals DONE! We are calling it a season on our New York State house renovations. We discovered a broken window in the laundry room when the exterior trim was being painted (ok, we didn’t discover it, the painter did), and so found a great window man that is very reasonably priced and does excellent work. He replaced a few cranks and some window seals, as well as a fogged window in Hubby’s office. Scope creep in all things! As we are winding down on the year, it looks like Hubby isn’t going to do anything with his built-ins. The carpet upstairs is waiting until the spring. While we are in Florida this winter the staircase is being updated – a new railing is being installed and the stairs will be stripped, restained and polyurethaned. The carpet will go in after that is complete. Hubby and I will be heading down to Florida in December to do some work on that condo: hurricane windows, paint, some kitchen and bath upgrades – I’ll have a list once we see it again and go through every inch. Right now we “know” what we need to do, but once we get down there I expect the scope to expand. Fortunately it is only around 1400 sq ft (including patio), and we can only do things to the inside (but not move walls – darn! the kitchen could definitely stand to have a wall torn down), so there is only so much renovating that can be done. There will be a load of shopping though! I expect we will take more time with that when we return in January. Next year besides the staircase I expect to finally install garden lighting! I have it all planned out, and Hubby and I are going to DIY it! Maybe I can convince Hubby to do something with his built-ins too? They look like hell compared to the rest of the house, and definitely need an upgrade. • Link to our completed renovations. Do you have renovations, painting, updating planned for your house this year? If so, what projects are you undertaking? He came in & said “We’re having our roof redone on Monday.. His Amish crew is coming.” So.. we had our roof replaced about 2 weeks ago.. They were super fast and efficient and since our house is so small, it was completed in a day & a half. The owner came back to check on it & didnt like the way the chimney was wrapped so he redid that while he was also cutting our chimney down & putting a cap on it.. D said this roof was made to last forever.. it should be the last one we ever have to put on this house..